My Paper Trove: Paper Sweeties 1st Birthday Designer's Hop! Paper Sweeties 1st Birthday Designer's Hop! 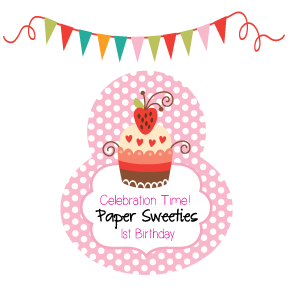 Paper Sweeties is celebrating it's 1st Birthday and you are invited to join in the fun! We're having three fun days of blog hops and a contest too! Here's one of my favorite Sweeties, Emma, peeking out from her birthday banner sentiment made with the Occasions stamp set! I layered up some fun dp along with a die cut balloon and number 1 to celebrate this very important day! A couple of gems and sequins bring a little bling to the party too! Paper Sweeties will be giving away the ENTIRE AUGUST RELEASE to one lucky person in August! That's all five release sets ~ a $50 retail value! You can find all the details on the Paper Sweeties Blog! Paper Sweeties will also be attending the Creating Keepsakes Convention in Charlotte, NC August 15th - 17th ... stop by and say Hi to Debbie! Thanks for stopping by and have fun hopping today! I agree with Amy...these colors are so perfect for summer fun! So adorable, Pattie! Adorable.....love the summer colours, perfect! Sooo cute, Pattie! Love the fun paper and sweet Emma! Just darling, Pattie! I adore how Emma is peeking from behind the banner and that balloon is so adorable! Thanks for joining us for our 1st Birthday Designer's Hop!! Ohhhh Emma gave me a little chuckle with the way she's peeking out at us...ADORABLE!!! sweet card Pattie, so glad to be celebrating the PS Birthday with you! Hi Pattie! You've done a fab job on this. Emma looks adorable peeking up to say Happy 1st Birthday. How cute, and a perfect color combo. Just darling, Pattie! I love Paper Sweeties stamps and this is just precious. Pattie, Your little Emma is just adorable! Wonderful colors and layout! Ever so sweet, Pattie! Really love all those colorful hexies and your gorgeous color work! Like the colorful creation with the honeycomb background pattern. she's adorable in these colors!